I’ve been asked a lot of questions over the years about ‘Is’, so here are the most common and my responses. Tell us the book title and your author name. 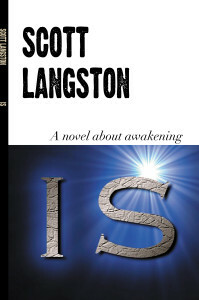 My name is Scott Langston and the title of the book is “Is”. Originally, I had intended to book to be called ‘The Domino Effect’ – one of the themes in the novel is how the actions of one character can have unforeseen impact on another – like falling dominoes. I even commissioned a Magritte-style cover page with this image. However, the novel became something a little different as it went through several edits, and ‘Is’ summed up better the overall message of the novel. I started writing this book when I was twenty years old. Many of the themes were beyond my grasp, and it wasn’t until I ‘re-found’ the novel fifteen years after starting it that I had something approaching the maturity to do the book justice. If I had to pin it down to a precise moment, the novel was born after watching the film ‘Four Weddings and a Funeral’, specifically the funeral scene. I found it very moving, and imagined having to write such a eulogy myself. It has certainly been a labour of love! I have physically lost the book on two occasions – the first time requiring a re-write almost entirely from pencil notes in an old scrap book. From first putting pen to paper to finally seeing the book in print took twenty years. That’s a long time. The book has been a part of my life, and my continual tinkering with it represented my desire to be a writer. What makes this a book that other people must read? I think the book has a lot to say about the fundamentals of how life is. It’s spiritual, without being religious. It raises many questions and, I hope, answers a few too. It’s about perspective – another way of looking at life and death and God. If these questions do not interest you, then you probably shouldn’t bother reading the book! What people need to read this book? Nobody needs to read this book. Nobody needs to do anything. That’s one of the central messages of the book. There is no requirement – life just ‘is’. What sparks your creativity? Any tips to help others spark their own creativity? Writing is a muscle like any other. It needs exercising and flexing, otherwise it wastes away. I keep a blog, as well as trying to have more than one project ongoing at a time. When one dries up, I can try my hand at something completely different. That’s how ‘Benny and Binny’ was born – a children’s story I wrote with an illustrator friend. Right now, I’m working on a novel set between Vietnam and France, dealing with roots and belonging. It’s the biggest project I’ve tackled so far. I’m also tinkering with a novel for teenagers about philosophy, tentatively called, ‘Henry Porter and the Stone Philosopher’ – although I cringe at the title now and it really hasn’t gotten off the ground yet. What has been the biggest stumbling block in your writing? Can you share some tips to help others get past similar problems? I took a year off work to ‘be an author’ full time at the same time as we had our baby daughter. I was under the impression that I could care for her and write at the same time. In short, children have been the biggest stumbling block for my writing. I need time and space to write, and kids don’t allow for much of either. That said, my life is considerably richer for having become a dad, and that can only come out in my writing eventually! I guess another hurdle has been the management of distractions. When I turn on the computer, it’s all too easy to spend hours fiddling with stuff I’ve already written, updating my website, or simply surfing, rather than actually writing. I now have a dedicated laptop for writing which doesn’t have internet access. What motivated you to become an author? What motivated you to get into this unusual industry? I believe I write because I have to. If you simply want to write, then my advice would be: don’t bother. Find something else to do and save yourself a whole lot of trouble. Writing is a lonely and often demoralising business – except when the connection comes through and then it’s without equal. So, it wasn’t really a choice – I have to write. Tell me about the most unusual things you have done as an author to promote any books? Book promotion is my weakness. I have done the rounds of local bookshops where ‘Is’ was set, and a few copies have been sold that way. I’ve run book signings. I haven’t really done anything inspiring in the field of self-promotion. I know I ought to. How did you decide on that setting and what you did to create a complete and vivid setting for your readers? I grew up in Cornwall. It never crossed my mind to set my first novel anywhere else. It’s a truly magical and inspiring locale – even now as I write this |I can smell the sea air and hear the seagulls – though I’m thousands of kilometres away. What inspires you about the hero or heroine in your book? What makes them memorable for the reader? I’m not sure Martin inspires me. He’s a protagonist, rather than a hero in the true sense of the word. Insomuch as everyone’s first novel is autobiographical, I guess Martin is in some respects me. His getting to grips with life and his enlightenment are ideals I would reach for. Is there a villain or something that causes friction in your novel? The conflict rests between expectations and risks, between safety and leaps of faith, between believing and knowing. Martin takes risks, when society would have him do otherwise. He trusts to himself, when society would have him do otherwise. He is prepared to love, not just another, but himself. This is perhaps one of the most difficult yet rewarding things we can achieve in life.